This book is the Annual Report on Development of Africa edited by the Institute of West Asian and African Studies (IWAAS) of the Chinese Academy of Social Sciences (CASS). The Annual Report is composed of seven parts: Main Report, Special Report,Academic Frontier, Regional Situation, Hot Spot Issues, Market Assessment and Documentation. Contributors of the Annual Report are from more than 20 research institutes, governmental departments,and enterprises as follows: IWAAS of CASS, Chinese Academy of International Trade and Economic Cooperation (CAITEC) of the Ministry of Commerce, the Institute of African Studies of the China Institutes of Contemporary International Relations (CICIR),Shanghai Institutes for International Studies (SIIS), Department of African Affairs of the Ministry of Foreign Affairs, China-Africa Development Fund (CADF),China National Petroleum Corporation (CNPC),Sinopec,China State Construction Engineering Corporation (CSCEC), China Railway Construction Corporation Limited (CRCC), China Nonferrous Metal Mining (Group) Co., Ltd. (CNMC), State Grid Corporation of China, Three Gorges Corporation (CTGC),China Telecom, AVIC International, China Jiangxi Corporation for International Economic and Technical Cooperation(CJIC),China WuYi Enterprise CO,Ltd., and Qingdao Ruichang Cotton Industrial Corporation. Economic and trade cooperation is of vital importance to China-Africa relations, it is also the academic frontier in African studies in general and China-Africa relation studies in particular in China. As the principal part in cooperation, the Chinese enterprises have the final say on the status of China-Africa economic and trade cooperation. 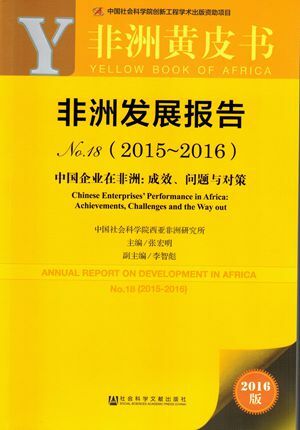 In order to coordinate Chinese enterprises going into Africa, and to promote China-Africa industry and production capacity cooperation, this year’s report is specialized in Chinese enterprises’ performance in Africa: achievements, challenges and the way out, which includes one main report and twelve special reports. The main report gives a comprehensive account of Chinese enterprises’achievements and challenges in Africa, and the solutions or suggestions to their problems. In special reports, 12 contributors from central state-owned enterprises, province-owned enterprises and private enterprises elaborate, in accordance with their respective professions,on Chinese enterprises’operation status, their difficulties and challenges, and policy recommendations from the perspective of being a principal part in cooperation. The fixed columns of Annual Report on Development in Africa of Regional Situation, Hot Spot Issues, Market Assessment and Documentation provide overall analysis of African politics, security situation and hot spot issues in 2015, probe into African economic situation and market trends, including trade, investment, project contracting and international aid, and examine on big powers’ relations with Africa and new trends and prospect of China-Africa relations as well. In addition, the annual report also includes a review on African studies in China, a Chronology of Africa and a chart on macro economic indicators for African countries in 2015.